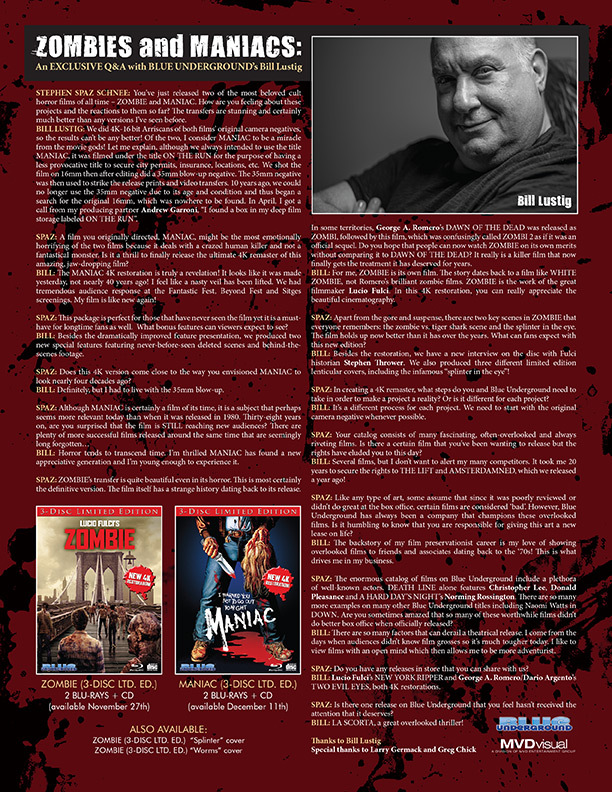 STEPHEN SPAZ SCHNEE: You’ve just released two of the most beloved cult horror films of all time – ZOMBIE and MANIAC. How are you feeling about these projects and the reactions to them so far? The transfers are stunning and certainly much better than any versions I’ve seen before. BILL LUSTIG: We did 4K-16 bit Arriscans of both films’ original camera negatives, so the results can’t be any better! Of the two, I consider MANIAC to be a miracle from the movie gods! 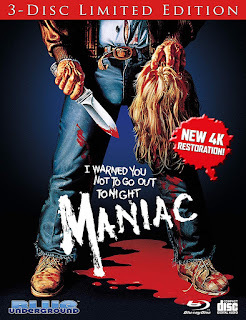 Let me explain, although we always intended to use the title MANIAC, it was filmed under the title ON THE RUN for the purpose of having a less provocative title to secure city permits, insurance, locations, etc. We shot the film on 16mm then after editing did a 35mm blow-up negative. The 35mm negative was then used to strike the release prints and video transfers. 10 years ago, we could no longer use the 35mm negative due to its age and condition and thus began a search for the original 16mm, which was nowhere to be found. In April, I got a call from my producing partner Andrew Garroni, “I found a box in my deep film storage labeled ON THE RUN”. SPAZ: A film you originally directed, MANIAC, might be the most emotionally horrifying of the two films because it deals with a crazed human killer and not a fantastical monster. Is it a thrill to finally release the ultimate 4K remaster of this amazing, jaw-dropping film? BILL: The MANIAC 4K restoration is truly a revelation! It looks like it was made yesterday, not nearly 40 years ago! I feel like a nasty veil has been lifted. We had tremendous audience response at the Fantastic Fest, Beyond Fest and Sitges screenings. My film is like new again! SPAZ: This package is perfect for those that have never seen the film yet it is a must-have for longtime fans as well. What bonus features can viewers expect to see? BILL: Besides the dramatically improved feature presentation, we produced two new special features featuring never-before-seen deleted scenes and behind-the-scenes footage. SPAZ: Does this 4K version come close to the way you envisioned MANIAC to look nearly four decades ago? BILL: Definitely, but I had to live with the 35mm blow-up. BILL: Horror tends to transcend time. I’m thrilled MANIAC has found a new appreciative generation and I’m young enough to experience it. SPAZ: ZOMBIE’s transfer is quite beautiful even in its horror. This is most certainly the definitive version. The film itself has a strange history dating back to its release. 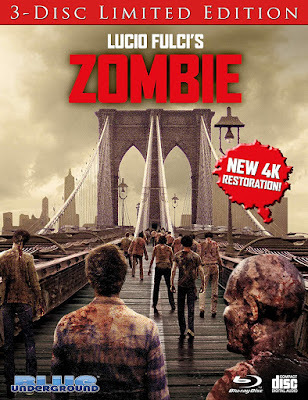 In some territories, George A. Romero’s DAWN OF THE DEAD was released as ZOMBI, followed by this film, which was confusingly called ZOMBI 2 as if it was an official sequel. Do you hope that people can now watch ZOMBIE on its own merits without comparing it to DAWN OF THE DEAD? It really is a killer film that now finally gets the treatment it has deserved for years. BILL: For me, ZOMBIE is its own film. The story dates back to a film like WHITE ZOMBIE, not Romero’s brilliant zombie films. ZOMBIE is the work of the great filmmaker Lucio Fulci. In this 4K restoration, you can really appreciate the beautiful cinematography. SPAZ: Apart from the gore and suspense, there are two key scenes in ZOMBIE that everyone remembers: the zombie vs. tiger shark scene and the splinter in the eye. The film holds up now better than it has over the years. What can fans expect with this new edition? 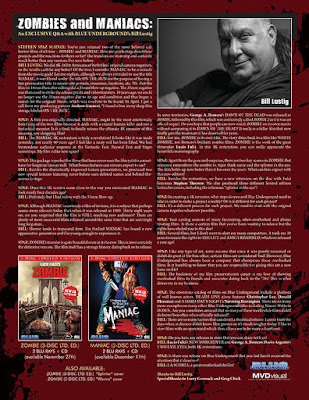 BILL: Besides the restoration, we have a new interview on the disc with Fulci historian Stephen Thrower. We also produced three different limited edition lenticular covers, including the infamous “splinter in the eye”! SPAZ: In creating a 4K remaster, what steps do you and Blue Underground need to take in order to make a project a reality? Or is it different for each project? BILL: It’s a different process for each project. We need to start with the original camera negative whenever possible. SPAZ: Your catalog consists of many fascinating, often-overlooked and always riveting films. Is there a certain film that you’ve been wanting to release but the rights have eluded you to this day? BILL: Several films, but I don’t want to alert my many competitors. It took me 20 years to secure the rights to THE LIFT and AMSTERDAMNED, which we released a year ago! SPAZ: Like any type of art, some assume that since it was poorly reviewed or didn’t do great at the box office, certain films are considered ‘bad’. However, Blue Underground has always been a company that champions these overlooked films. Is it humbling to know that you are responsible for giving this art a new lease on life? BILL: The backstory of my film preservationist career is my love of showing overlooked films to friends and associates dating back to the ‘70s! This is what drives me in my business. SPAZ: The enormous catalog of films on Blue Underground include a plethora of well-known actors. DEATH LINE alone features Christopher Lee, Donald Pleasance and A HARD DAY’S NIGHT’s Norming Rossington. There are so many more examples on many other Blue Underground titles including Naomi Watts in DOWN. Are you sometimes amazed that so many of these worthwhile films didn’t do better box office when officially released? BILL: There are so many factors that can derail a theatrical release. I come from the days when audiences didn’t know film grosses so it’s much tougher today. I like to view films with an open mind which then allows me to be more adventurist. SPAZ: Do you have any releases in store that you can share with us? BILL: Lucio Fulci’s NEW YORK RIPPER and George A. Romero/Dario Argento’s TWO EVIL EYES, both 4K restorations. SPAZ: Is there one release on Blue Underground that you feel hasn’t received the attention that it deserves? BILL: LA SCORTA, a great overlooked thriller!